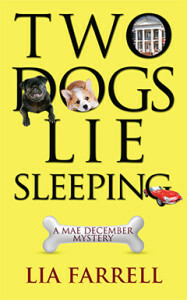 Two Dogs Lie Sleeping ($14.95, 282 pages, ISBN: 978-1-60381-969-5) is the second cozy mystery by Lia Farrell in a series featuring Mae December, the successful owner of a dog boarding business in Rosedale, Tennessee. When a well-loved former resident who spent fifteen years in hiding turns up dead, a small town police force looks back in time for answers. 4.5 Stars: “The story is told from several points of view—Mae’s, July’s, Ben’s, and others—and each point of view adds greatly to the story. Not only do the different viewpoints bring more information to light, but more characters are developed and the reader is drawn into the lives of a number of them. And through it all, there are a number of dogs who add even more charm to a delightful cozy mystery. This is the second in the Mae December Mystery series and I have read the first as well. The books stand alone just fine, but my choice would be to read them in order so that the growth in some of the personal relationships can be fully savored. Mystery readers can’t go wrong if they take a trip to Rosedale, TN, to meet Mae December and the entire cast of Two Dogs Lie Sleeping.” Read more…. “I have read both books and really enjoy Lia Farrell’s cozy mysteries. This is the kind of book, where from start to finish it is hard to try and figure out who committed the murder. Ms. Farrell brings back most of the characters from the first book. This is one item I really like about an author. Even if you haven’t read the first book in this series, some give you the back ground on the characters so that you are not confused as to who is who.” Read more…. Book three in the series, Three Dog Day, will be released in December, 2014. “Mae’s second adventure is even better than the first …. The mystery was quite suspenseful, while still fitting accurately within the cozy genre. If you’re looking for a compelling mystery, then this series is for you. I was kept guessing right till the end trying to figure it out before Mae and Sheriff Ben did. Lia Farrell writes very character-driven mysteries. All my favourite characters from One Dog Too Many are back and there is a new canine to love. ‘Tater’ is Mae’s new corgi puppy and she’s just adorable! Animal lovers everywhere will fall in love with Tater. Two Dogs Lie Sleeping was another fantastic whodunnit from Lia Farrell. This series is now one of my firm favourites and I’m really excited to see where she takes the series next.” Read more …. It’s early August in Rosedale, Tennessee, and July December Powell is alone at the historic Booth Mansion, putting the finishing touches on the Showhouse room she designed for tomorrow’s grand opening. A loud noise draws her to the nursery, where a man lies dying. Not just any man, but Tom Ferris, the love of her life, who she hasn’t seen since he disappeared with no explanation some fifteen years earlier. Who shot Tom in the back? What drove him away in the first place and made him stay away, even after his parents were killed in a car accident? What was he trying to tell July with his last breath? The gossip mill is in high gear in the small town of Rosedale, and July is the sister of Mae, a dog breeder and kennel owner who happens to be dating the sheriff, Ben Bradley. Ben’s close relationship with the December family has thrown a wrench in his investigation, forcing him to rely on Detective Wayne Nichols, his deputies, and his office manager Dory to do most of the legwork. Meanwhile July’s marriage is imploding, and Mae already has too much to deal with—including a new corgi puppy and Ben’s four-year-old son. Mae is torn between loyalty to her boyfriend and her sister as she does her darndest to get the bottom of a case that just seems to involve more and more of their friends and neighbors. Mother and daughter writing team Lyn Farquhar and Lisa Fitzsimmons live in Michigan and Tennessee respectively. Both are life-long readers who are also dog lovers. Lyn owns two Welsh corgis and Lisa has two pugs and a Siberian husky. Lisa works as a Muralist and Interior Designer and her mother, Lyn, is a Professor of Medical Education. Click here to find them online. Or so? Could this day get any better? July followed her into the laundry room with Soot and Ricky. The puppies jumped happily on Tallulah, their mother, who was napping in her bed beside the utility sink. Tallulah growled. Mae set the dog beds down on the other side of the room. “I’m sorry, Mae,” July said. Her face was tight. “I’m going to the lake house. I need a break from Fred.” She was frowning. “If you can’t keep them, I understand. I just don’t have a fenced area for them at the lake. The man who was going to build it can’t get to it until September. He’s all covered up with work this summer.” July leaned against the wall and began to cry. “Its fine, July, don’t worry. I can keep them.” Mae looked at her sister with alarm. July hadn’t cried in front of her in years. Now, for the second time in three days, her normally self-contained big sister was dissolving in tears. July put the bag of kibble on top of Mae’s dryer, unhooked the leashes from her exuberant young porgis and turned to leave the room. Her sister stepped around Ben as if he wasn’t even there and walked out. In the silence, Mae heard the slam of the door.